Zombies And Toys: New World War Z Poster - Just missing one thing.....ZOMBIES !! 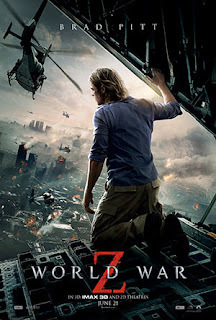 New World War Z Poster - Just missing one thing.....ZOMBIES !! The buzz for the upcoming feature film World War Z has been nothing short of titanic (good correlation huh ?) - and with each new passing trailer and TV spot that we are teased with, the ever-mounting question seems to be growing to a fever pitch... and that question is "Can we PLEASE get a closer look at the zombies ?" The other way of looking at it could be the marketability factor, the studio sees Brad Pitt as it's major selling point, so why push the notion any further than it already is ? Any way you slice it, the movie will be a colossal success, much as the book has been, and the studio will do its duty to keep us salivating until it's release on June 21st. Will this suffice to all of our faithful lovers of the flesh-eaters ? Sound off and let us know what you think - we here at Zombies & Toys will be on top of this movie and all of its gory news until it smacks us all in the skull this Summer.